Kirbie Goes to Hollywood: Sometimes, you do stupid stuff. Sometimes, you do stupid stuff. In this case, "you" would be "I." Do you guys watch MTV? Besides Teen Mom, the occasional True Life, and a few episodes of The Real World, I don't get around to MTV as much as I did as a teen. I was pretty obsessed with shows like Say What? Karaoke (surprise, surprise), FANatic (I always wanted to be Britney), Diary, and Making the Video (I always wanted to make my own video, so I liked to get pointers). Well, I don't watch much TV at all since I graduated. E! used to be on 24/7 at my house on Merida, but that was mostly due to fact I had my flatscreen available to my own disposal. Living with two other people and only having one TV means sharing and bonding over shows everyone likes, and honestly a lot of what I watch is on the DVR. Back to MTV: Do you guys watch it? It's apparent that most of my friends do, because on Monday I was flooded with texts, calls and e-mails saying "OMG! I'M WATCHING YOU ON MTV RIGHT NOW!" 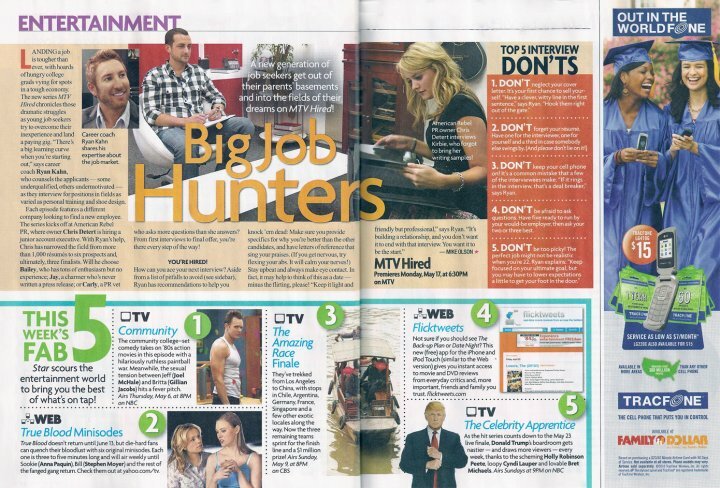 I'm not going to get in to the dirty details, but I'm on a show called Hired that premiered yesterday. Pretty much I am the epitome of epic failure on that episode: I do a casual interview with a career coach, where I was terrified of the cameras. My nervousness was apparent and he had to give me pointers to calm down. Then, at the actual interview (for an entry-level PR opening), I said was "organized" and then forgot my writing samples at home. Stellar. I recall the terror I felt at that exact moment, switching from being nervous about landing the job to being mortified that the whole interview might be broadcast on national television. That's the sad part. To be fair, I had spotted an error on one of the samples before I left for the interview and wanted to retype them all, however I would have been better off keeping them flawed because I left the damn things on the printer. Nobody would be able to tell if I was a miraculous writer or not. So, as someone who has interviewed for multiple internships and a variety of jobs, I'm being labeled as someone who made a "rookie" mistake... the stereotypical blonde chick who thinks she has it together but really is a mess. The people labeling? The Hollywood Reporter, The Huffington Post, Star Magazine ("Top Five Interview Don'ts" with my picture is my personal fave). We learn much more from our failures than our successes in life anyway. Just a stepping stone to greatness! Plus it gave you something great to blog about and something funny for us to read! Congratulations on being in Star Magazine!